Slowly, slowly heading back to, well, normal. Normal is not necessarily good. Normally, I have an awful time finishing anything and I'm in that place now. Hard to get all the mail opened and appropriately dispatched. Hard to get the suitcase completely empty and stashed. Hard to get my mind around the changes I want to make to the preliminary drawing for the prospective room addition and draft them. I can trace this affliction back to childhood. If it doesn't have a deadline, I have such a hard time pushing myself through to completion. (Is there a Procrastinator's Anonymous?) Perhaps that's why I gravitated to blogging and away from writing a novel. With blogging I get the reward of finishing something on a short timeline, while a novel stretches on an on, ever mocking me. My plan for blogging was to post daily, recording daily life as it happens. That part hasn't worked out so well as I run out of time and energy before it happens. 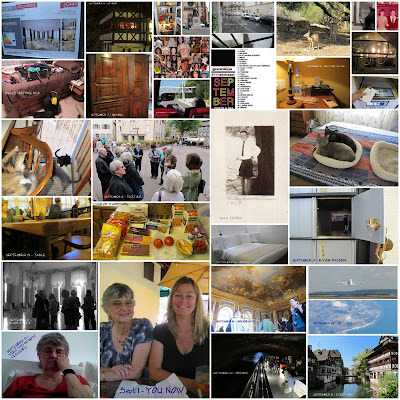 That happened on the recent trip to France, so I have lots of photos and fun still to share, and even some that go back to earlier trips. I surely can't cop to lacking material, although it violates the "today" aspect of daily blogging. My photo a day for "NEAR," deer babies hanging out near their mom. Along with what's "not done," there are a few "dones." Got the new tooth implanted, as I mentioned last time. On that same day, I had an appointment with the spine doctor and will be having an MRI Monday to assess what's really going on. Lower back problems are chronic, but an apparent compression fracture, fairly recent, in the mid back is worrisome, to me at least (and hurts). I'm looking for possible risks and remedies. I got my purchases abroad unpacked. I had declared a big $130 in expenditures at customs. Two items were shirts I bought to wear because one shirt I thought I packed didn't make it into my suitcase, and and the second because it was colder a few days and I needed another long-sleeved one. I think once worn I don't have to include them in my purchases. I got a couple of packets of fabric somewhat like typical Alsatian fabrics, and a few pieces at the Beauvillé factory store. Don't Beauvillé's cats look familiar? Speaking of cats, my feral menagerie has been sparse since my return. The old-timer, Black Kitty, has been spotted a couple of times, but other than that, it's only been Extra and the tiny kitten, the latter presumably one of Socks' babies. No sign of Socks or her other baby or Stripes or Bella, the original Momma cat. Chloe is in utter misery with horrible mats. She doesn't let me touch her and the only ones I've gotten out of her have been by grabbing hold of one and hanging on while dodging teeth until she pulls away, leaving the mat with me. She occasionally gets one out herself but ends up consuming it, turning it into a fur ball for later presentation. I made an appointment for her to get sedated and cleaned up and get some medical things taken care of at the same time. Poor girl. I've spent two days plus, washing every couch and bed and window seat throw, towels and pillows and cat nests from the spots where the cats routinely sleep, that I haven't done for awhile. With all the nice clean cat fur I've thrown outdoors, I hope there are birds or animals nesting now that can use that soft stuff. I have one more load of washed and dried cat nests that need shaking out and I'll be done. I'm back to Thursdays out and the ladies have been busy. A new batch of hats and scarves, this time for civilian and baby use. Correction: The orange sox are Barbara's which she is comparing to Rose's gray pair. Rose has finished one pair of sox. and is part way through the next pair. Note that Rose insists that her sox match each other; no random stripes. I think these must be Judy's scarves. Norma has been knitting potholders. Last week she taught the technique to Ursula. Ursula has been busy applying the technique. 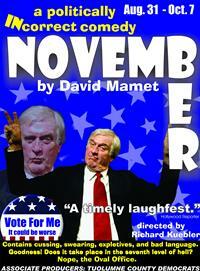 I'm going to a play today at Stage 3 in Sonora, "November," a politically incorrect comedy." 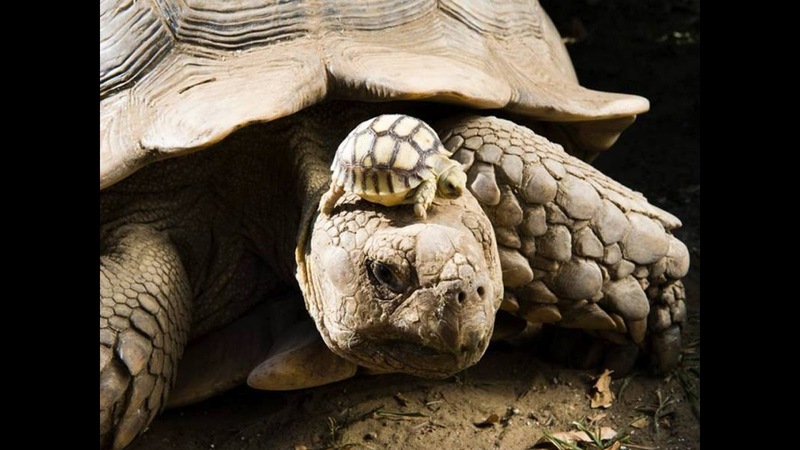 Here's a photo I grabbed out of a Power Point email on Animal Love, with the usual mommy/baby pictures. This one is sooo different, it just tickled me. See you soon (for what that's worth!). Hi Lee, Glad to see you getting back into the routine. Love the 'cats' fabric. I can understand why it spoke to you.